Some players in the National Football League throw for touchdowns. Some run for a crazy amount of yards. Others even make a living by knocking the quarterback into the next century. And while these are the most important ways to take home a fat pay check, they aren’t the main determining factor in a player’s popularity. That piece of information can be measured best by merchandise sales. Every quarter, the NFL Players Inc. — the marketing and licensing arm of the National Football League Players Association (NFLPA) — releases a list depicting the NFLPA Top 50 Player Sales. The purpose of this list is to account for the “overall sales of all licensed products from online and traditional retail outlets as reported by more than 80 NFLPA licensees such as Nike, VF Imagewear, Fanatics, Outerstuff, Fathead, McFarlane Toys, Oyo Sports, Bleacher Creatures, FBF Originals, Forever Collectibles, FanPrint and Photo File.” Based on this information, we can learn which NFL players run the sport from a retail standpoint. Or more importantly, which players own the popularity contest. As of Thursday, the numbers for FY16 Q1 — which takes the total sales from March 1 through May 31, 2015 — are in. And for the first time in his career, a player whom fans have always seemed to rally behind, now sits at the top of the merchandise mountain. We could easily just tell you who this particular gridiron giant is, but we thought it’d be more beneficial to see which other gridiron giants are loved by the bulk of football fans. With that, here’s a look at the NFL’s top five leaders in merchandise sales. 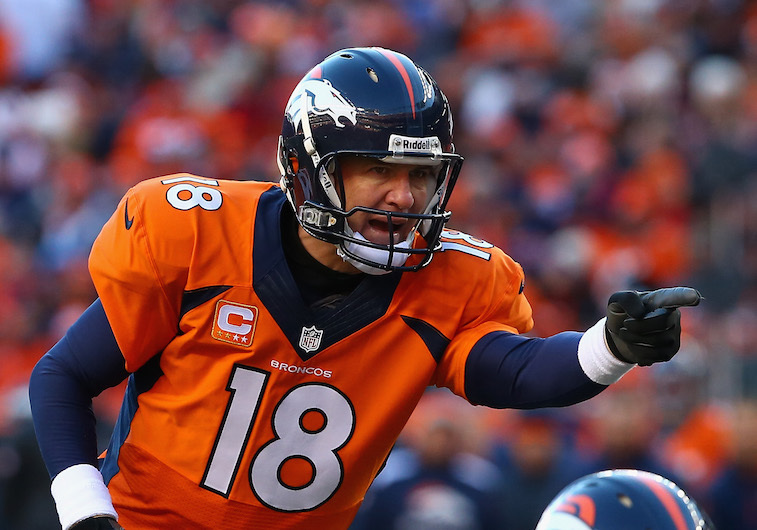 Peyton Manning’s performance during the 2014 season wasn’t nearly as prolific as his recording-setting 2013 campaign, yet he still managed to throw for 4,727 yards and 39 touchdowns and lead the Denver Broncos to their third straight AFC West crown. While Manning has yet to capture that elusive second Super Bowl, his ability to continue to play at a high level — despite being 39 years old and undergoing multiple neck surgeries — makes him one of the more popular figures in the National Football League. For these reasons, Manning was not only No. 5 in overall merchandise sales, but also finished fourth among kids in hardlines and apparel. 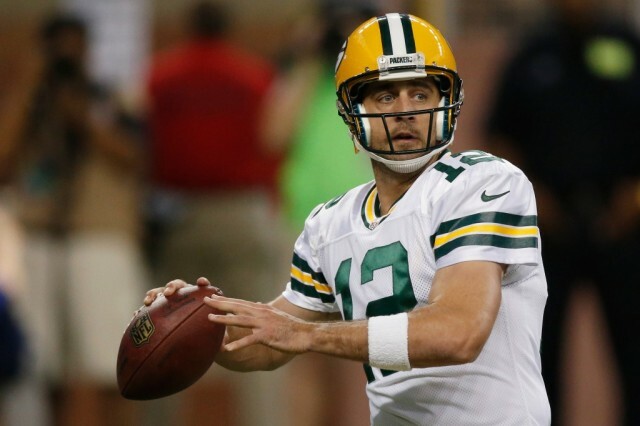 There are very few players in the NFL who have it better than Aaron Rodgers. 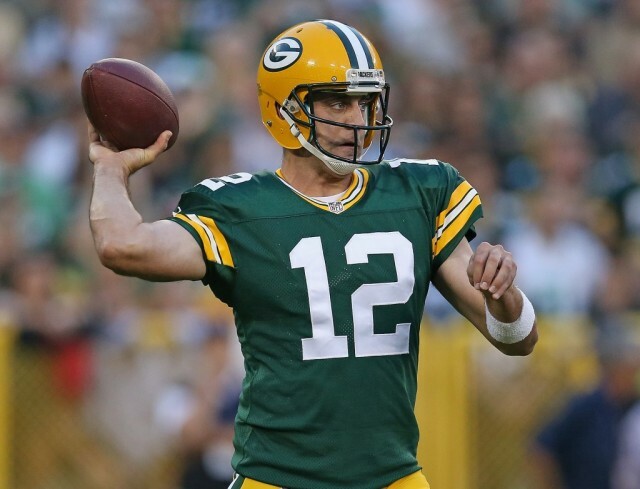 The Packers quarterback is the reigning MVP, has an envious social life, and is considered to be the best in the business at his position. He is also clearly quite popular, coming in at No. 4 on the NFLPA Top 50 Player Sales Rankings, while being the second most popular among kids in hardlines and apparel, and fourth most sellable among women’s gear. As long as he continues to keep doing what he’s doing, we’re sure it will be quite sometime before Rodgers has to worry about his popularity fading. 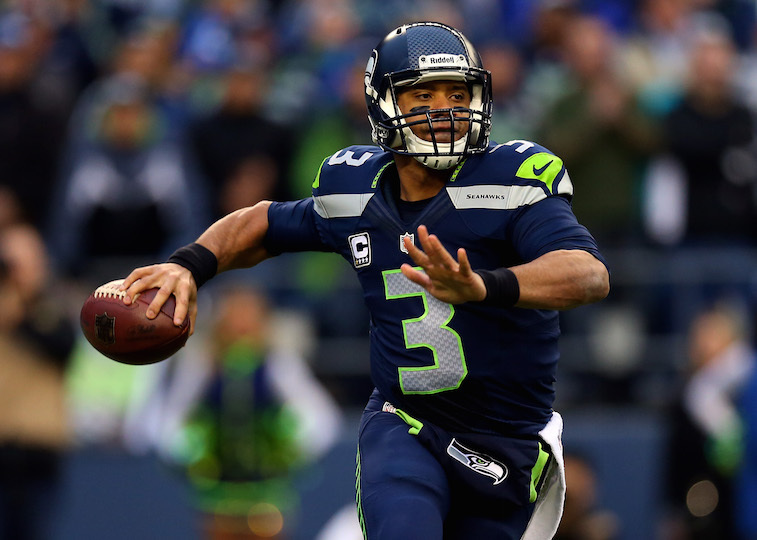 Russell Wilson may have led the Seattle Seahawks to back-to-back Super Bowl appearances (including one victory), but the jury is still out on where he stands among the NFL quarterback elite. With contract disputes coming to the forefront this offseason, one has to wonder if the Seahawks would really let their young QB walk or they’re merely playing hardball. And yet, even though he golden boy persona has started to rub people the wrong way, folks continue to go out and buy his gear. According to the NFLPA, Wilson is third overall in total merchandise sales and is the most popular among kids in both hardlines and apparel. Whether you love him or hate him, you have to give it up for the guy who was selected 75th overall in the 2012 draft. The guy’s making moves. 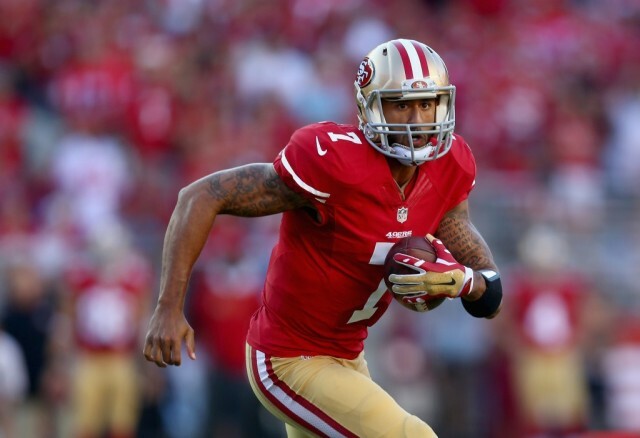 Is Colin Kaepernick a legitimate franchise quarterback or an athletic freak of nature who just happens to play the quarterback position? Perhaps this is the year we finally get our answer. Yet, no matter where he stands among the pundits, Kaepernick, the player, is easily a fan favorite. Just look at his merchandise sales and see for yourselves. The San Francisco 49ers QB is the fifth most popular among kids in hardlines and apparel, the most popular among women’s apparel, and tops when it comes to the sale of Nike jerseys. If you forget about the field for a second and simply follow the dollars, it’s instantly clear that Colin Kaepernick has the goods. 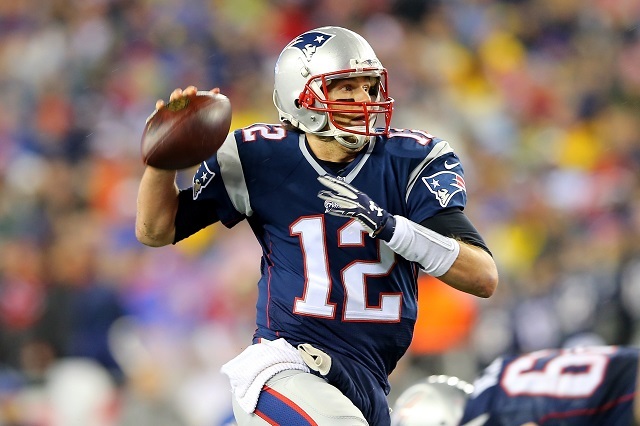 Neither the Deflategate scandal nor a potential suspension to start the 2015 season can stop Tom Brady staking his claim as the National Football League’s top seller. For the first time in his incredible career, the Patriots QB sits atop the NFLPA Top 50 Player Sales List. And based on the information provided, it doesn’t seem close. Aside from being the second most popular among women’s apparel and sales of Nike jerseys, Brady outsold the rest of the league in Forever Collectibles bobbleheads, Fatheads, Lids custom player headwear, and Oyo Sports mini-figures. And just think, he’s usually on dominating on the gridiron. Yet, considering the facts, there’s no denying that No. 12 owned the NFL retail game from March 1 through May 31, 2015 — making FY16 Q1 the quarter of Brady.